1. Condiments are never Paleo friendly. Paleo sauces are either weird consistencies, expensive, or tricky to make. 2. Eating out is mostly Paleo-friendly. Perhaps this is where the (ish) part of my diet is obvious. Eating out might be hard for someone following an orthodox Paleo diet. I’m guessing restaurant chefs season their chicken breasts and burgers with Paleo no-nos. But I’ll pretend not to notice, if it means not cooking every meal myself. 4. Paleo is tricky for snackers. Grazing worked well for the junk food diet I followed the first 35 years of my life. I lived on handfuls of Doritos, slivers of cake, Ritz crackers with cheddar, and graham crackers smeared with peanut butter. Now? Sometimes I eat frozen peas as a Paleo snack, but the sugar adds up. Ditto for raw carrots. Celery sticks are good. But do you know what’s better? Celery sticks with peanut butter. Which is, of course, not Paleo. 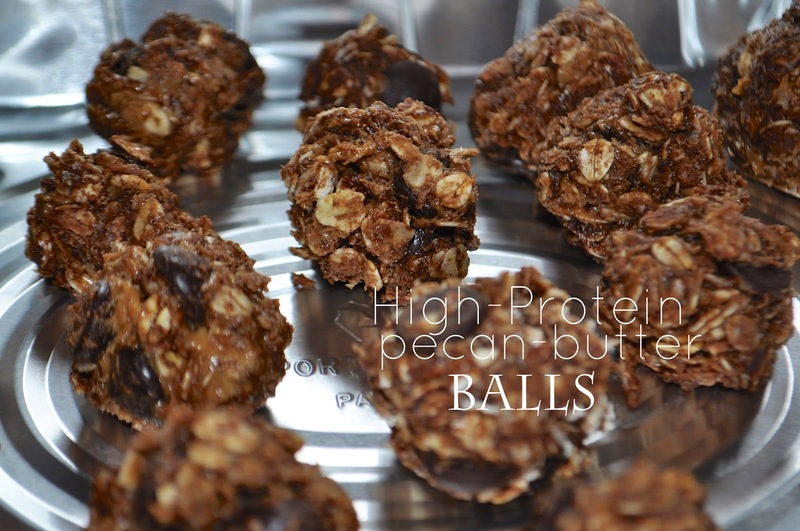 In search of snacks, I created these High Protein Pecan-Butter balls. Even though these aren’t totally Paleo, they do have enough protein to make me feel full (and keep my hand out of the Doritos bag). Combine all ingredients in a large bowl. Grab your kids and tell them they’re helping you make a delicious snack. Gather around the bowl, scooping up handfuls of delicious-ness and forming it into balls. Place on cookie sheet. Chill for an hour. Toast the pecans in a large skillet, until fragrant. Blend toasted pecans in food processor. The high oil content will ensure you get a creamy butter. Delicious all on its own! Add a pinch of cinnamon and a dash of salt. Continue blending.